Pets Starting Fires – It Happens A Lot! Is Your Pet An Arsonist? Hey, don’t laugh. Last November, a dog in Washington, pulled his bed up against a space heater. 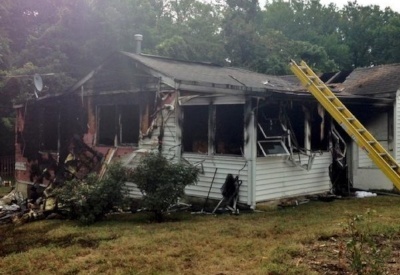 The bed (then home) ignited into a large blaze, sending both dog and owner to the hospital. That same week, a black Lab in Connecticut jumped up on a gas stove to snag an abandoned slice of pizza. While committing his caper, he turned the stove knob on and caught the pizza box on fire – setting the kitchen ablaze. And back in August, a cat in Maryland, knocked a couple candles off a bedroom shelf and onto the mattress. The house (seen below) was mostly destroyed, but thankfully, no one was seriously hurt. Now of course your pets aren’t ACTUALLY trying to burn your house down (well, at least I hope not, for your sake), but as pet owners, we sometimes unknowingly set the stage for such unfortunate events to happen. And it's been reported that at minimum 40,000 pets die each year in house fires* (often due to smoke inhalation), so being aware and taking the necessary precautions to prevent these tragedies from happening is ideal. And since July 15 is National Pet Fire Safety Day (yes, that’s actually a thing), I thought it would be a good time to go over a few items that can drastically lesson the odds of your pet becoming an accidental pyromaniac – as well as saving you from having a very awkward conversation with your insurance agent. First, let’s talk about electrical cords – or as many puppies and kittens call it: The Ultimate Chew Toy! It’s always good to minimize the exposure of cords to your pets. Not only are they harmful on many levels for dogs and cats to chew on (e.g. electrocution), once damaged, they can short out, spark, and start a fire. You should never use an electrical cord or extension cord that is damaged in any way. One great way to minimize the potential of your pet chewing on a cord is minimizing the length of the cord by rolling up and tying together any excess cord length, then placing the rolled up cord behind your furniture or a more secure and safe location. If your cord is going to be exposed, you might want to unplug the cord and then wipe it with a cloth that has been sprayed with bitter apple spray (available at nearly all pet stores). Bitter sprays may not work for the most determined pets, but it can be highly effective with many. 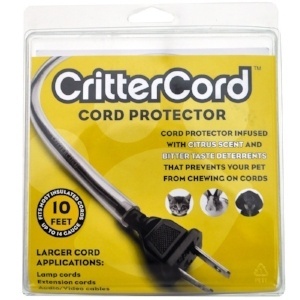 There are many varieties of cord covers, too, and even some pet-specific cord covers (see inset image). Additionally, keep location of electrical cords, outlets and heaters in mind when picking where to place your pet’s food and water bowls, beds and crates. Another common cause of house fires – especially those started by pets – is from candles. Any time a candle is lit, it poses a potential threat. One of the best ways to minimize this threat is to get rid of them entirely. Sure, this sounds a bit extreme, but it’s the best way to assure a candle will not burn down your home. Luckily, flameless candles are becoming more attractive and more popular. They are now easily available at most hardware, variety and specialty stores. 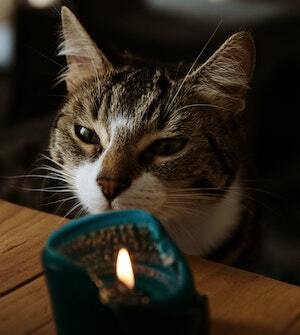 Keep in mind, though, flameless candles use batteries and if your pet gets at and chews them, it won't likely start a fire but it can cause major digestive upset and burns to their mouth, esophogus, and intestines on the way out! If setting the proper mood lighting is essential, and you need to have real flames, make sure you place your candles in the most secure locations possible. But, as any cat owner can attest to, this is easier said than done. Look to see if your candle locations are accessible to any of your pets. Then, think a step ahead and look down to the most-likely location the candles would get knocked over to. If it’s anywhere near papers, curtains, fabrics, hardwood floors, rug or carpet, or any other flammable materials, rethink your choice of location. And don't forget about those lit jack-o'-lanterns at Halloween! You can try these 6 fun ways to light your pumpkin without a candle. 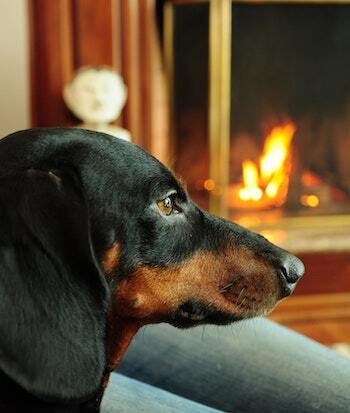 Fireplaces and wood stoves are another potential hot spot for pets. Come fall time, pets love to curl up to the warmth and comfort of a nearby fire. But this is a place where all types of trouble can occur. Pets can get too close and receive burns to their faces, paws and tails. And if your dog is one who’s obsessed with sticks, well… you can see the potential problem there. So every pet owner with a working fireplace should have a pet-proof screen or a safety barrier. Pets should also be trained to stay a safe distance from stoves, fireplaces, and even chimineas and campfires. As a precaution, you should never play active games (such as ball chasing) in a room with a lit fire. And to be on the safe side (you should always be on the safe side with your pets), bring them with you when you leave the living room or place of the fire. An unattended pet with a hot fire is just asking for trouble. Gas stoves are another common house fire culprit. Luckily, this threat has a simple remedy that has proven to decrease the potential for fire. 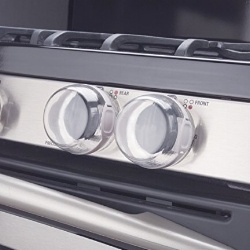 Stove knob covers are a must-have for any home with both a gas stove and pets or young children. The final item you should be aware of is electric blankets. Most pets love the comfort of a warm bed, but at no time should you have your pet lay on or sleep with an electric blanket – either in their bed, or yours. Both dogs and cats can claw or chew on these and damage the blanket’s heater wires. Once these wires are exposed, there is a serious threat of electrocution. If your pet had an accident on the wires, or you accidentally spill a bedtime cup of tea, coffee or water, you and your pet could be electrocuted. The exposed wires could also heat up the sheets or mattress to a point of causing a fire. So refrain from using these to warm up your pet’s bed. And, if your pets sleep with you, electric blankets are something you really should be getting rid of. As with most preventive measures – common sense is crucial. Let the three real-life pet owner stories atop this article serve as cautionary tales that no matter how confident you are in providing a safe environment for your home and all its inhabitants, you can never be too careful. Make sure your house is fully equipped with smoke and carbon monoxide detectors. Replace the batteries twice a year. According to Consumer Reports you should replace detectors at least every 10 years as the sensors become less effective over time. Have an emergency plan. Involve ALL members of your family – including pets. Then rehearse your plan every year. The National Fire Protection Association has a free emergency planning guide with a grid to map out your escape route. Have an updated emergency kit. Makes sure the needs of all family members (human and pet) are included. Things to think about for your pet’s needs include: A leash or harness, water, a blanket or bed, a week’s supply of food, a toy or something to chew on, poop bags, and any medications needed, as well as a copy of their medical records. Kits should be stored in a place that you can easily reach during a quick exit from the home. Make sure the retrieval of your kit is part of your emergency plan. You can download our free emergency preparedness kit here. Keep the phone number and address of your nearest emergency animal hospital in your phone. Also, have a current photo of your pet – just in case you get separated from them. Pick up a pet alert sticker for your front door. These help inform rescuers and first responders that pets are in the home. ASPCA has a free sticker you can order. And please make sure to remove it when you move. It's not ideal that it remain on a door or window of a home that no longer has pets. In addition to being an unhealthy part of your pet’s diet, batteries can also pose a risk of fire to your household. 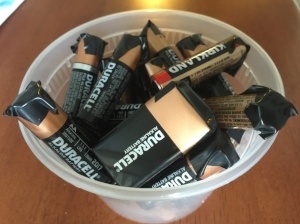 Here's a little-known hazard associated with 9-volt batteries. This video news story demonstrates how quickly a fire can start when batteries aren't stored properly. And see what happened to Dave's house (Dave is in the news story, too). He had pets at home, but they got them out in time. Luckily every family member was safe. before storing them (prior to proper disposal). We do it for all our batteries! You do however need to be like a Boy Scout… Prepared! That's why I encourage you all to take a pet first aid course and check out this video on how to give CPR. Because smoke inhalation is what most pets suffer from and succumb to in fires, having firefighters equipped with the necessary equipment is crucial in saving lives. If you want to help provide life-saving pet oxygen masks to fire departments and other first responders, I encourage you to learn more about (and consider donating to) the Emma Zen foundation and/or the Wag’N O2 Fur Life program. I hope this fire safety information helps you and your family from becoming an unfortunate statistic. And if you allow pets into your workplace (what a fantastic idea! ), here are a few resources and guidelines from Trupanion and a video they produced to demonstrate how they helped acclimatize their four-legged office mates to the sounds of fire drills.